See It. Touch It. VR It. Virtual Reality started as a dream that someday we would all be able to experience great new worlds in a technology everyone would have to have. This was back in 1990s when Sega tried to introduce their VR system but failed due to tracking issues. That is when I had the dream that someday it would be “real”. Fast forward 20 years to 2016 and low and behold Oculus had figured it out...well sorta. It has taken the better part of 3 years to get to where we are today in VR and I have been waiting to bring this form of entertainment to everyone! Now it is possible with my partners Carl and Kelly sharing the vision. 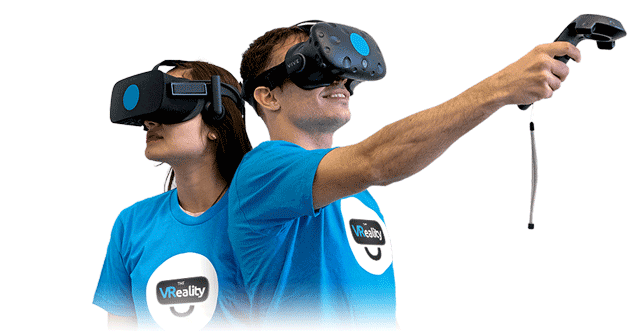 Join us in this 20 year journey and help make it reality... VReality. We only use the best technology in the game. With the all-new Vive Pro we welcome you to the next generation of VR. Equipped with a fully wireless setup, VIVE Pro offers next level immersion - ideal for creating multi-player experiences without disrupting one another. Celebrate with your friends in our virtual world! Rent out the whole place or just grab a couple stations to have fun with. Spend the whole time in multiplayer or let everyone choose their own game. Whatever your birthday needs are, we can accommodate you!